The document is predictably strong on "bread and butter" issues for Maori and workers, but invisible on their political "agency" in changing the system. There are eight references to Maori, 10 to worker/s, and three to union/s. All these references are solely economic in character. So Maori, workers and unions are not given any political role in a systemic transition away from capitalism, or even away from the current neoliberal stage of capitalism. Accordingly, there is not a single reference to "capitalism", "capitalist", "neoliberal" or even "class". And just one passing reference to "market". Despite the presence of many self-described socialists within Mana, no mention is made of the words "socialism" or "socialist". Nevertheless, there are important policy assaults on financialisation, which is the central pillar of neoliberalism. So the document advocates the abolition of GST, the introduction of a financial speculation tax, reduced income tax for the poor and steeper income tax for the wealthy, a capital gains tax and other tax policies which would confront financialisation without mentioning the words "neoliberalism" or capitalism". Overall, the document is reasonable on immediate "bread and butter" issues, but sidesteps the questions of political economy and political "agency". The inference is that voters should leave politics in the hands of Mana politicians, since nobody else is given a system change role. My mark: B+. It is surprisingly weak on Te Tiriti o Waitangi and tino rangatiratanga. The treaty/tino rangatiratanga are linked four times to constitutional matters. But these references are very brief and abstract, leaving no meat on these constitutional bones. Plus there are two references to the treaty in regards to economic matters. Overall, a disappointing result from a party whose main membership consists of flaxroots Maori steeped in Te Tiriti and tino rangatiratanga. My mark: C.
And it is predictably woeful on ecological matters. There is not a single reference to "ecology" in the policy document. There is just one passing reference to "ecological" in a sentence where it's buried under social, economic and spiritual issues. The word "environment" appears three times, but only in reference to our social/legal environment, not the world of nature. The word "environmental" appears twice, but only in passing and buried under social, cultural and economic issues. The word "sustainable" is used three times each in reference to transport and housing, which of course intersect with the natural environment, but the linkage is weak in the document. Mostly there's an economic aura given to "sustainable", which also appears five times in direct reference to the economy. Climate change is probably the gravest emergency facing humanity today, threatening catastrophes on a primeval scale. Incredibly, Mana's manifesto makes merely two references to climate change/global warming. And one reference is merely economic, referencing the monetary cost of climate change policies. The other reference is part of a general statement on a post-oil future. Overall, a disjointed, abstract and unconvincing approach to ecology. There's no sense that systemic alternatives to climate change and other capitalist erosions of the natural basis for life on Earth should be woven into every fibre of Mana's policy. My mark: C-. Of course, we cannot define any party by way of its policy manifesto alone. Usually the social character and track record of party members, and especially party leaders, is at least as important. But my overall impression of Mana's consolidated policy document is of punches pulled and opportunities missed in the arenas of political economy, political agency and constitutional remodeling. And, regarding the life-sustaining world of nature, I see a party manifesto that is lamentably weak, despite several disconnected references to a "post-carbon world". Therefore, my overall mark for Mana's predictable and surprising manifesto would be somewhere between a B- and a C+. I hope that Mana does well in this year's parliamentary election, though my hopes are based more on good people in the party than on this rather disappointing manifesto. I also hope that the Green Party and candidates from Labour's left wing do well at the polls, and that they get together with Mana to start forging a Left Bloc that at the very least begins to roll back neoliberalism and tackle climate change. British-based economist, activist and writer Derek Wall is a member of the Green Party of England and Wales and is the author of several books on ecology and politics. Wall will speak via video link at the Climate Change Social Change activist conference in Melbourne over September 30 to October 3. He maintains the ecosocialist blog Another Green World. 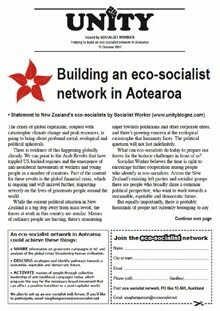 He spoke to Green Left Weekly’s Simon Butler about the politics of ecosocialism. The assault on the basic life support system of our planet, the basic biological cycles, climate being just one, is caused by our economic and social system. We live in a capitalist society and capitalism tends towards the destruction of the conditions necessary to sustain life. SOCIALISM made the headlines locally and at a national level last week. The Prime Minister explained his admission that a socialist streak runs through New Zealanders by acknowledging he too holds socialist ideals. And an aspiring mayoral candidate blamed socialists on Gisborne District Council for the increase in his rates demand, which he thinks is a form of wealth tax. Of course, he failed to mention his properties are collectively worth many millions of dollars and the proportion of his rates to property value is less than one tenth of what the vast majority of us contribute. As Noam Chomsky has pointed out, “the term socialist has been so evacuated of content over the last century that it’s hard even to use in any sensible way. The Soviet Union was called a socialist society by the two major propaganda powers in the world at the time. The West called the Soviet Union socialist to defame it by association with the miserable tyranny and the Soviets called it socialism to benefit from the moral appeal that true socialism had among large parts of the general world population”. But the Soviet Union was about as remote from socialism as you can imagine. The core notion of traditional socialism is that working people have to be in control of production and communities have to be in control of their own lives. The Soviet Union was the exact opposite of local control, the working people were virtual slaves. Chomsky suggests the collapse of the Soviet Union was in fact a great victory for socialism. There are attempts today to describe a detailed vision of a socialist future and some of the most extensive and detailed are examples like Participatory Economics, and the moves toward an extension of democracy to the industrial sphere through worker-owned co-operatives. Philosopher and educationalist John Dewey’s main work concentrated on democracy and he pointed out that as long as we have industrial feudalism — that is, private power controlling production and commerce — our democracy will be very limited. We have to move to what he called industrial democracy if we hope to have democracy of any significance. Dewey believed that direct participation in a democracy would foster an unexpected talent for thoughtful deliberation in ordinary citizens. “We lie in the lap of an immense intelligence,” he said. The difficulty was to unleash this intelligence, which remained dormant until “it possesses the local community as its medium”. In The Public and its Problems — Dewey’s only work of formal political philosophy — he outlined an elaborate programme of truly participatory democracy, one built around face-to-face interactions in “neighbourly communities”. Socialism is the idea that people should be in control of their own destiny and lives, including the institutions within which they work and the communities within which they live. This is the potential and my vision for local government. So when the label socialist gets used pejoratively by people who should know better, I hope John Key is correct, that New Zealanders do all have a socialist streak and we are proud of that commitment to local, egalitarian democracy that protects us from the tyranny of both big business and big government. As the historic “Arab Spring” surge for democracy sweeps across northern Africa and the Middle East, the time has come for a renewed international push to finally break the cruel & illegal Israeli siege of Gaza. The Egyptian people have overthrown the military dictator Mubarak and are demanding that the Rafah border gates with Gaza be permanently opened to allow for the free flow of people and goods. In tune with this epic era, the Viva Palestina 6 international aid convoy to Gaza, due to depart London in early December, is set to become a major factor in breaking the siege for all time. The permanent opening of the border will be the greatest form of aid for the besieged 1.5 million Palestinian people of Gaza. All of Viva Palestina’s previous land convoys have successfully entered Gaza. As well as bringing millions of dollars of desperately needed medical and humanitarian aid, VP has been told by people in Gaza and by supporters of the Palestinians in Egypt that they have helped play a role in highlighting the unjust policy of the now ousted Mubarak regime in maintaining the siege. The democratic revolution in Egypt opens the prospect of ending that siege for good. The convoy will be working in partnership with humanitarian organisations in Egypt to help bring that about before another year of unnecessary suffering is inflicted on the Gazans subsisting in what British prime minister David Cameron described as the world’s largest open air “prison camp”. Kia Ora Gaza has been invited to send a New Zealand contingent to join this historic international mission. A 6-person Kia Ora Gaza team took part in the Viva Palestina 5 aid convoy, which broke through the siege in October last year, so we have a proven track record. Kia Ora Gaza is launching a nationwide fund-raising appeal to send another team of 6 Kiwis to join this siege-busting convoy from London. Our target is $70,000 which will cover flight costs and purchase of NZ convoy vehicles and humanitarian aid. We have less than 3 months to do so. Our success depends on the generosity of spirit of humanitarians like yourself. Kia Ora Gaza is a charitable trust whose entire funds go to the sole benefit of the people of Gaza. All helpers are unpaid volunteers. All our accounts are subject to audit by a professional auditor (donating his services free) who is independent of our Board of Trustees. Please send your donation by direct credit to our bank account: Kia Ora Gaza, 03-0211-044718-000, Westpac Bank, Onehunga Branch. 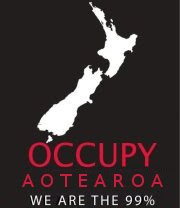 Or write a cheque for “Kia Ora Gaza” and post it to Kia Ora Gaza, PO Box 59007, Auckland. Kia Ora Gaza invites New Zealanders to apply to be part of our 6-person Kiwi Team to Gaza. Application emails, containing your contact details, skill levels and personal history, should be sent to office@kiaoragaza.net by Monday 19 September. able to cover your personal expenses (estimated to be NZ$3,000). Forward this notice to all your friends and ask them to do likewise. If you have a blog, facebook page or Twitter – make the story viral. Join the Kia Ora Gaza facebook group. 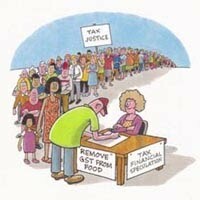 Attend or organise support meetings or fund-raising events. Ask your church, mosque, marae, union or community group to offer a donation & message of support. Visit our website kiaoragaza.net for regular updates. The Palmer Commission, headed by former NZ prime minister Geoffrey Palmer, was appointed by the UN secretary-general to examine the Israeli attack on Gaza aid ship Mavi Marmara in May 2010. Nine humanitarian volunteers, eight of them Turkish and one Turkish-American, were killed by Israeli special forces who stormed the vessel in international waters during the dark of night. After a number of delays, the final report by the Palmer Commission is due for release tomorrow (Friday, 2 September 2011). According to media reports, its conclusions look likely to be an uneasy compromise between Israel and Turkey, both represented on the equally balanced commission. As we await the official release of the Palmer Commission's report, Kia Ora Gaza is sending you a backgrounder on Israel's disputed, but clearly bloody, seizure of the Mavi Marmara. It's from Gisha, the Israeli-based Legal Centre for Freedom of Movement (previously published on our website kiaoragaza.net). This legal opinion may help you identify where the legal facts lie in a tragedy which has been, and still remains, highly disputed and incredibly propagandised. As well, Kia Ora Gaza is pleased to announce that we expect to take part in another international aid convoy to Gaza within the next few months. We will announce more details as planning is finalised. We are now calling for your donations to help fund our mission, made more important by the Arab Spring and the subsequent possibility of levering open Israel's terrible blockade of Gaza.